Anda is a skilled player in a multiplayer online game called Coarsegold Online who learns about gold farmers – paid players in the game who simply hunt and gather treasures in the game for other high-bidding players who pay for, rather than earn, these points and tokens. At first annoyed by these illegal “cheaters,” and shortly after hired to hunt them for money, she learns that these gold farmers are overworked, poorly compensated players in other parts of the world for whom gold farming is not just a game, but their livelihood. Anda deals with conflicts with others in her guild in the game, confronts her own conflicted feelings about the gold farmers, tries to allay her parents’ concern about her online behavior, and struggles with right and wrong from different perspectives. I had been waiting since September 2014’s reviews for this book and was not disappointed by this beautiful graphic novel. Unfortunately, the book starts with what I believe to be a possibly irresponsible misstep by Doctorow–an introduction addressing the gap between those who make and those who consume products today, followed by an oversimplified treatment of this complex problem involving a young person. Sometimes a little information is bad thing for young readers, such that I recommend parents read this alongside their young readers, as well-intentioned Anda’s online actions in the real world could be harmful. I’d have preferred the author let the story stand alone as a beacon of awareness or call to action for those who would interpret it as such. I don’t think it is for Mr. Doctorow to address young readers “You still have to do the harder work of risking life, limb, personal fortune, and reputation”–this book is aimed at 13-year-olds! This is my personal, perhaps overprotective opinion, but I will leave you to decide. Now let’s consider the loveliness that exists beyond the introduction. The artwork is stunning (who could leave that cover on the shelf? ), the watercoloring effect giving subtlety and life to the seemingly simple black line drawings; the ruddy cheeks under the stark white big eyes are particularly expressive in many of the characters. I am interested in picking up Jen Wang’s other title Koko Be Good for more. The transitions between online and real life are creatively rendered with dreamlike segues, and online interactions are punctuated with message boxes and buttons to keep even the least tech-savvy reader on track, and to speak to the experienced gamer in the visual language in which they operate. The lead character, Anda, is a smart, sensitive, independent gamer girl with supportive, loving parents in a healthy home–eschewing the trend of abusive or clueless parents in young adult fiction–whose character and friends give readers a spate of female gamer heroines for a change. The cast of characters is fully-developed, showing different sides in the many situations that happen throughout the book which keep the plot moving and interesting. I recommend this book for graphic novel fans of Persepolis, by Marjane Satrapi and Anya’s Ghost by Vera Brosgol. Charlaine Harris is the author of several popular adult fiction series (Sookie Stackhouse, Aurora Teagarden, and the recent Midnight, Texas series). 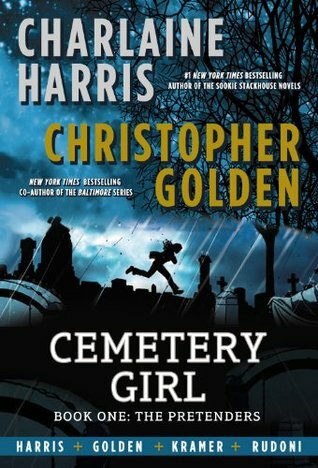 In this adult graphic novel, Cemetery Girl, she teams up with author Christopher Golden, who has written both adult and teen fiction (Secret Journeys of Jack London), and illustrator Don Kramer, who is known for numerous projects at Marvel and DC Comics. The team has created an engaging and dark story about a girl who calls herself Calexa Rose Dunhill. The story opens with the girl being dumped in the cemetery — presumed dead. When she wakes up a few panels later, she only has fragmented memories of her previous life. It is enough for her to realize someone wanted her dead. She is scared to call the police or even leave the cemetery because she doesn’t know who was after her or why. While she’s working out how to find food and stay safe, she witnesses a group of young people performing a black magic ritual in the cemetery. In their efforts to bring a friend back from the dead, they kill the friend’s sister as a blood offering. Calexa has to figure out how to tell the girl’s family what happened without putting herself in danger. The plot moves quickly and is well-illustrated to add a sense of danger to the story. I particularly enjoyed the disjointed images from Calexa’s memories. There is a frustration in not having everything clearly seen that made me feel connected to what Calexa must be feeling. This is the first in a trilogy. Looks like Book 2 will be available in October 2015. I can’t wait!